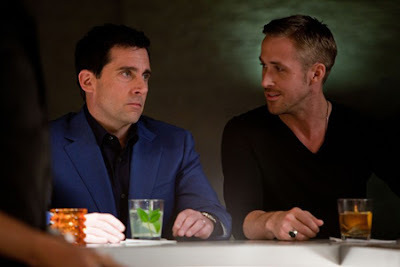 The Jordan Movie Blog: Movie Review: Crazy, Stupid, Love. Since Michael Scott is no more on NBC's The Office, we're going to have to get used to having our Steve Carrell fix on the big screen. Carrell gives another strong solid performance as an everyman divorced Dad in Crazy, Stupid, Love. Carrell joins an extremely talented cast that included Ryan Gosling, Emma Stone, Julianne Moore, Kevin Bacon and a surprisingly effective debut acting turn from classical singer Josh Groban. This rom-com plays like a mix between Love Actually and Dan in Real Life (another Carrell vehicle). Directors (yes, two directors) Glenn Ficarra and John Requa put together a hodgepodge of romance, comedy and drama that features a sobering look at the lives of separated/divorced parents. The best part of the movie focuses on Ryan Gosling's character Jacob, a womanizer and ladies man who knows the art of the pickup inside and out. He ends up mentoring Carrell's Cal who recently became separated from his wife (the always brilliant Julianne Moore). The bar pickup scenes that ensue early on in the movie are hilarious and made even more dynamic by the performance of Gosling. He is the runaway star of this movie and seems to really enjoy playing this character. Clever, funny, confident and extremely handsome (so I was told by my girlfriend), Gosling gives Jacob that extra edge that we see in performances such as Heath Ledger's Joker and Tom Cruise's Magnolia turn. I wouldn't be surprised to see the Academy reward Gosling in a slightly comedic role come Oscar time. Carrell is good as usual but I couldn't help noticing a bit of Michael-Scott-style mannerisms coming out in some of the bar scenes. Throw in some solid child acting and the overall cast of this movie is worth the price of admission. I know everyone loves Emma Stone but I'm not sold on her just yet. She was OK in this movie but not amazing in any way. All in all there's a lot of typical rom-com formula in this one that mixes in with some refreshing dialogue and quality acting. The big coincidence that is revealed about two thirds of the way through the movie just seemed a bit too convenient and slightly forced to me. I would recommend seeing this though but there's no need to run out to the theater to watch it. This has rental written all over it in my book. A pretty-good 3.5 out of 5 JRs for Crazy, Stupid, Love.